This is situated in the Darjeeling district of West Bengal, India. It comes under Darjeeling Wild Life division and can be reached from Siliguri in 30 minutes. Sukna, the gateway to the sanctuary, is only 13 km from Siliguri and 28 km from Bagdogra Airport. The sanctuary sprawls over 159 km of reserve forest and was started as a game sanctuary in 1955. In 1959 it got the status of a sanctuary mainly to protect the Indian Bison and Royal Bengal Tiger, which were facing the threat of extinction. The forest type in Mahananda WLS varies from riverain forests like Khayer-Sisoo to dense mixed-wet forest in the higher elevation in 'Latpanchar' area of Kurseong hills. The variation in altitude and forest types helps the existence of a large number of species of mammals, birds and reptiles. 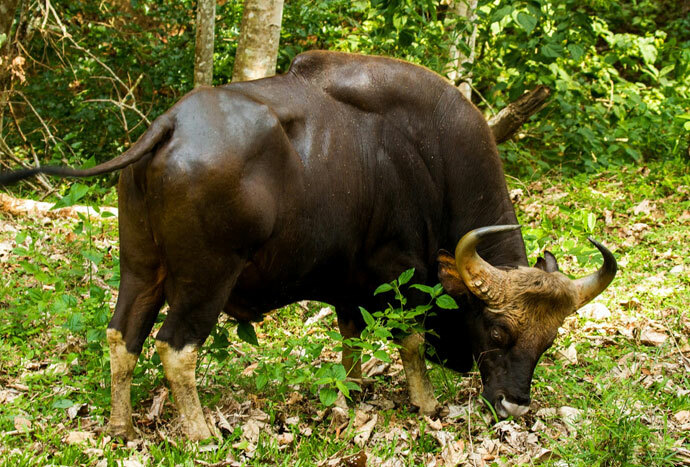 The important mammalian species include Royal Bengal Tiger, Indian elephants, Indian bison, spotted deer, barking deer, many species of lesser cat, Himalayan black bear, leopard including clouded leopard and many other smaller animals like rare mountain goat (Serow), porcupines, snakes, etc. The Sanctuary also holds hundreds of feathered species. The exciting list includes some very endangered species like fairy blue bird, Himalayan pied hornbill,etc. Among the others; swallow, swift, thrush, babbler, warbler, roller, minivet, sunbird can be found in abundance.